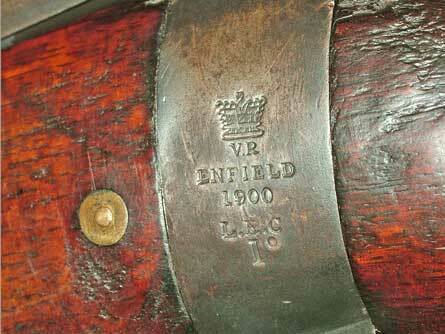 While cruising the EuroArms Italia website, I came across this interesting Enfield carbine. It's obviously a real Lee Enfield cavalry carbine made in 1900, but the stock looks to have been shortened, most likely as a civilian sporter. It retains most of it's correct and rare attributes, such as the leather site protector and flattened bolt knob. These were characteristics only for carbines, along with the shorter 6 round magazine, which enabled sliding in and out of saddle buckets easily. The carbine version of the Lee series of rifles started around 1895 and were made up until the adoption of the SMLE around 1902. Volley sights were done away with as this was a short range weapon (but the sights were still graduated to 2000 yards, not so short range). The barrel lost around 10 inches and the weight reduced by ten pounds. The earlier rifles had sling hooks also for saddle use, which were universally discontinued on the introduction of Enfield rifling. With the advent of the Boer War, Enfields were quickly issued to troops shipping out, but were found to shoot off target, as the sealed pattern had defective sights, and the approval process missed that important item. 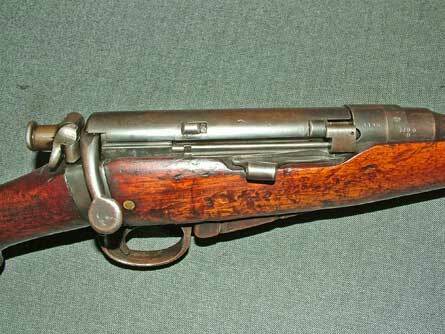 After quickly modifying the guns in the field, and the factory turning out a correct sight, the Enfield was quickly on it's way to becoming the most long lived rifle of the British empire.